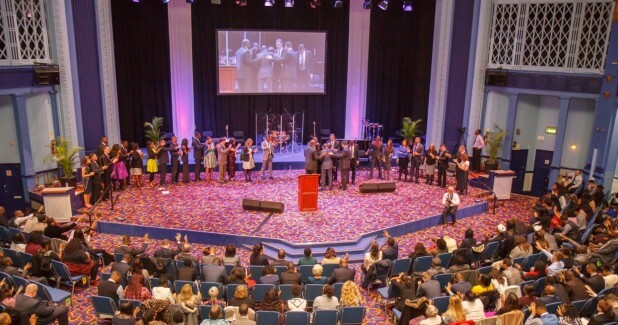 Back in 2013 The Potters House Christian Fellowship decided to begin the process of upgrading its audio system in their flagship UK Church in Leyton, East London. 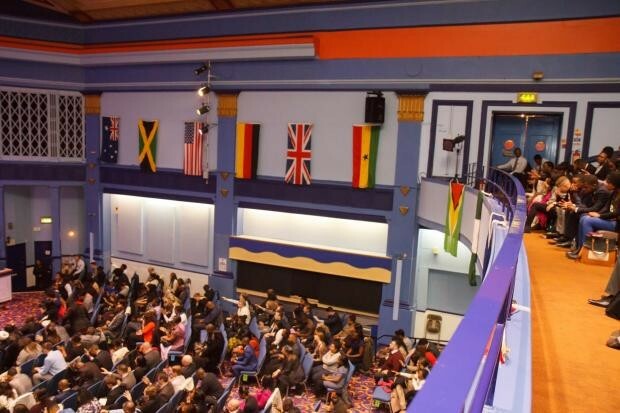 Housed in a large former Cinema and Bingo Hall the existing system was struggling to accurately transfer the message from the Worship leaders to the congregation. The dynamics of the lively, high energy, resident praise band were also being held back by the existing system. This process took Jason Campbell – Sound Technician at The Potters House – to the PLASA 2013 trade show where he took in information on a number of manufacturers and possible ways to enhance his Church’s audio offering. The show gave Jason his first opportunity to listen to KV2 Audio’s ground-breaking products – most notably a full VHD System in the AudioLab. Being suitably impressed with a brand previously unknown to him, Jason visited KV2 Audio’s stand and spent time discussing the options and how to progress. Over the course of the next year a number of site visits and demonstrations took place as Jason looked to be completely certain on which audio system to invest in. KV2 Audio were delighted when it was unanimously agreed that of all the options put forward, the KV2 ES system offered very high quality audio, at an attainable price point and without being visually intrusive in the venue. Being such a large space several factors needed to be considered when installing the products – including a large balcony requiring additional coverage. The brief initially suggested that the main Front of House system be flown – however with a roof height of over 10metres, the system would have needed to be dropped significantly in order to successfully reach underneath the balcony. The decision was taken to make use of two large decorative alcoves on either side of the stage, in which a pair of ES2.6 2x15” subwoofers were housed along with the dedicated EPAK 2500 amplification and control units. As access to these areas was limited, the fronts had to be removed and the Subwoofers hoisted up into position. The decorative grills were then reinstated, completely hiding the subwoofers from sight, whilst still offering impressive low frequency output from a compact system. The ES1.0 3-way mid/hi units were then flown below these units to evenly cover the main congregation space. This was yet another project in which the ES System has astounded listeners with such incredible clarity, definition and output from such a compact system. Common and misguided opinion would suggest that many multiples of other manufacturers speakers would be required and this had indeed been the case with several other companies proposals, however KV2 Audio’s True Point Source approach to loudspeaker design discounts this and the results are perfectly clear for everybody to hear. With such a sizeable balcony section, under and over balcony delays were also deployed and time aligned to ensure even coverage and accurate HF content. Four of KV2 Audio’s compact passive ESD6 2-way 6” speakers were installed under the balcony and specified in white to blend in with the ceiling in that section. 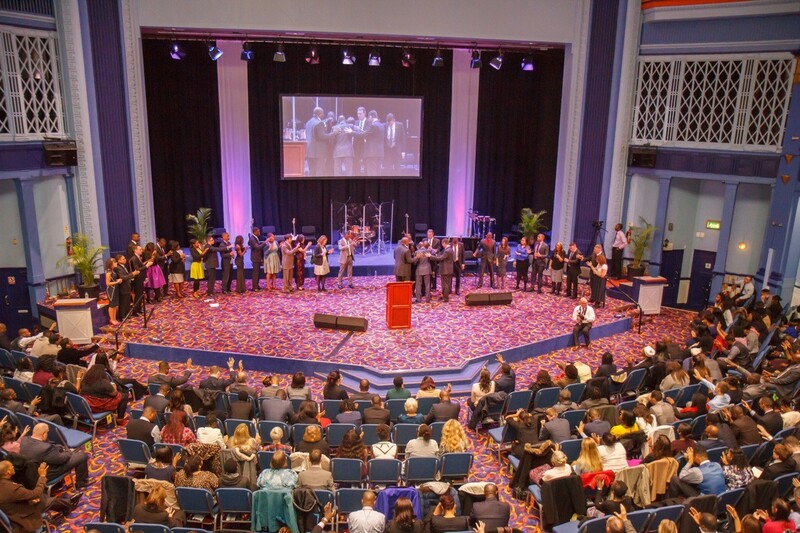 This area was deemed a key part of the venue as during some previous large Church conferences, whilst operating at full capacity the audio from the previous front of House system had just got lost. For the large upstairs raked balcony seating area, a pair of the recently released ESD15’s were utilised. The ESD15 features a Coaxial 15” & 1” driver with a dedicated 6” mid range speaker. This unit was specified due to the impressive full range output – again from such a compact solution – which excels in live performance and speech applications and integrated exceptionally with the main ES System. Both Potters House and KV2 Audio are delighted with the overall results that were achieved with a small number of products in such a large environment. For further information on KV2 Audio’s product range and philosophies please see http://www.kv2audio.com or contact the UK office on +44(0)1423 816868.